Created in the fifties, the gehu - which has variations such as the big gehu and the bass gehu - was intended to make up for the lack of lower register sounds in the Chinese orchestra. Comprising of a body, bridge, spine and bow, the gehu is a hybrid between the Western cello and the erhu. It is bowed just like a cello and has a body covered by animal skin (usually horse, lamb or snake). The creation of the instrument is largely credited to the Shanghai Conservatory of Music’s Yang Yusen, who wanted to create an instrument that would merge traits of the erhu with the science of the cello. However, most orchestras and composers still prefer to utilize the cello rather than the gehu. Composers usually prefer the thicker timbre, established tonal quality as well as the greater range of volume presented by the cello. Scored in the same manner as the cello, the Chinese gehu shares the same playing techniques as both the erhu as well as the cello. 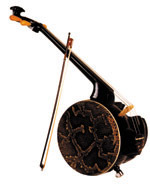 The bass gehu - the largest instrument within the huqin family - is adapted from the Western double bass. The role of the gehu in the Chinese orchestra is similar to that of the cello and bass, usually scored for in the identical manner. However, the musicians often lament the fact that the gehu is considerably softer and thinner is sound quality than the cello. The unstable nature of the instrument and its relative unresponsiveness demands high technical control by the musician. Though it has been argued that at least two gehus are needed to produce sound as loud as one mere cello, this hybridized instrument undeniably allows it to blend seamlessly into the Chinese orchestra. Want quality Gehus from a trusted source?